If you’re a client of mine you’ve seen the image below in my BraskaJennea Magazines. If we’ve met in person you’ve seen the “Oompah Loompah” Wal-Mart and Shutterfly prints, and the “Vampire Grey” Walgreen’s prints alongside their professional lab counterparts. You’ve felt the paper quality differences as well from my Kodak Endura Professional as opposed to “Photo Paper”. I’m so thankful to finally see the rise again back to full service Professional Photography…helping clients have beautiful, tangible, prints showcasing our works of heart to hang in their homes…instead of just on social media! There’s a big cry right now for “Give me digitals, or I’m gone!”, but walk into a traditional Portrait Studio that’s been around awhile, and that “disc” you walk out with winds up only being for your own personal computer use. Most don’t include a print release, and they’re sized so small they look strange on social media, and for good reason. They, like me, don’t want their beautiful works of art butchered by retail printers and cheap retail ink that’s only going to fade or yellow like those prints your parents have of you in that box in the closet. Keeping them low res is a necessity because sadly enough if people can jack your work with a shoddy screen grab or download from Facebook that looks distorted from stretching to print a 4×6 then by jolly they will. Thankfully though people are finally coming back to the realization that those “old school” Portrait Shops have hung onto all along….digital media changes, the technology we had 5 years ago is hard enough to navigate, much less finding readers or software to load discs and programs from 20 years ago. Computers even now are rumored to start rolling out sans a CD drive at.all. Children today have no idea what a land line phone or Walkman is! Who’s to say that in 10 years, much less 100, people will even know what a .JPG file is…or how to view it? I think my First thru 3rd grade years were made perfect simply by a “Computer Game” on an ooooold, HUGE, Macintosh computer. The one, the only, OREGON TRAIL! Up there with programming exploding fireworks later in 7th and 8th grade in DOS Command Prompt those were the highlights of my Elementary School career. I still remember when that box of O.T. GIANT floppy discs came out of the cabinet! It was GAME TIME! I was about to cross some rivers, kill some food, and catch some illness that could take me or my family out all while battling thieves, weather, and busted wagon problems. They seemed like they were 10×10 back then, but now I know they were really only 5.25″ squares. 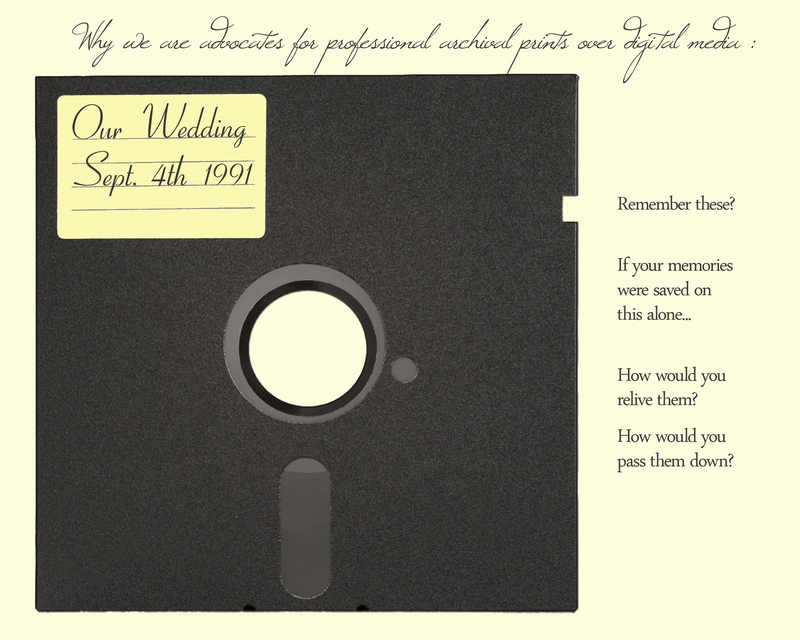 Later in school we learned we could save our work to those floppy discs….they were multipurpose! A few years after that we got those 3.5″ Hard floppy discs. A lot smaller, could hold “a lot” more, and were much more durable than their large counterparts. I still have a box of my first ever digital camera pictures, and work from high-school and college, saved to those discs. Ahhhh the memories they must hold. There’s no way to access them! I tried plugging in an old Floppy Reader a couple of years ago to my laptop….nothing happened. I made sure they were unlocked so I could read them, and nada. So, while I get it, we’re a digital society, I must ask you this important question…What would you do if your parent’s or grandparent’s wedding images were solely stored on one of these bad boys? What if that CD breaks, gets lost in a move, or your child scratches it? What if your external and/or computer hard drives crash, at the same time, (ask me all about that one!)? Really? You’re 100% comfortable, and certain, that some unseen super computer server somewhere in the universe won’t evvvver fail? You’re positive that with all of the recent data breaches stealing credit card info, and leaking images stolen from celeb’s phones and cloud storage systems that your photos are ALWAYS going to be safe and stored? You have a lot more faith in that system than I do. I pay my WONDERFUL Online Gallery people at Shootproof.com archival fees each month to back-up my client’s images for at least three-years (after that I think it just gets a little expensive storing hundreds of thousands of images), but if their site, or the Cloud, or Pixieset, or Pass, etc… were to be hacked, or fail, or what.ev.er, how would you view your memories? My liability is gone after I deliver your products, storing for as long as I do is merely a courtesy. If your Facebook account got deactivated how would you get those images back that were on that phone you had 5 years ago and never saved? If your phone got water damaged and refuses to boot up any longer how would you view those images of your child’s birth and life that you had stored no place else? Yes, if Heaven forbid you had a fire, a flood, a natural disaster, etc… that ruined your prints, digitals might save you…that is if the media format you had them saved on somehow survived, but chances are that disc is gone too. So, don’t ask me for “Just a CD”. That’s not the BJP way. It used to be, but I turned a corner 3 years ago, and I want my clients to have tangible parts of their legacy to pass down. I wan them to have tangible heirlooms they can flip through at Christmas in a giant box that’s so worn it’s about to fall apart from all the family memories tucked away inside,a nd all of the times it’s been passed around after stuffing ourselves with turkey and pie. There really isn’t a comparison for professional archival quality prints that you know will look just as vibrant and transcendent long after you’re gone. Once you see a Bride looking like a sunburned orange fictional character out of Willy Wonka accusing you of tampering with her images, or an image you edited of a beautiful pink, warm, newborn looking grey and lifeless hanging on a client’s wall, that’s it. You educate, educate, educate, and become a “hybrid” print and select few digitals photography business. 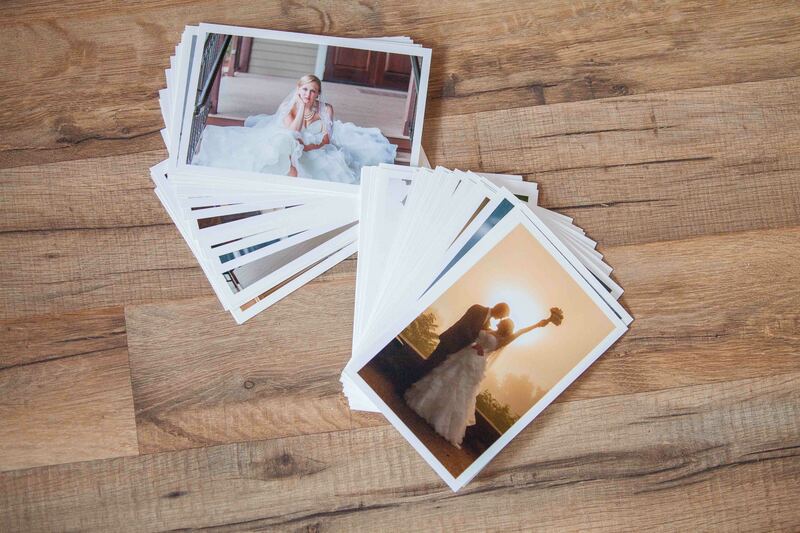 Print your client’s memories. Show them the comparisons in your studio, or online like this one. And if you can find one show them an old school Floppy Disc. We owe it to them to help them pass these memories on, and stand the test of time!